City of Mississauga digital mapping data contains very detailed topographic and planning information clipped to the City of Mississauga municipal boundary based on a scale of 1:2,000. 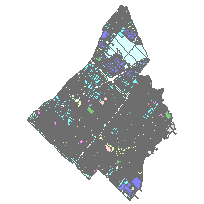 This data set contains locations categorized by Zoning By-Law in the City of Mississauga, Ontario. Metadata was created using documentation provided to Scholars Portal by the City of Mississauga. The data loaded come from the Q3 shipment from the City of Mississauga Transportation and Works Department. Some contours datasets are loaded from the Q4. All maps use rectangular coordinate values expressed in metres and based on the 6 degree Universal Transverse Mercator system, NAD 1983 (adopted).